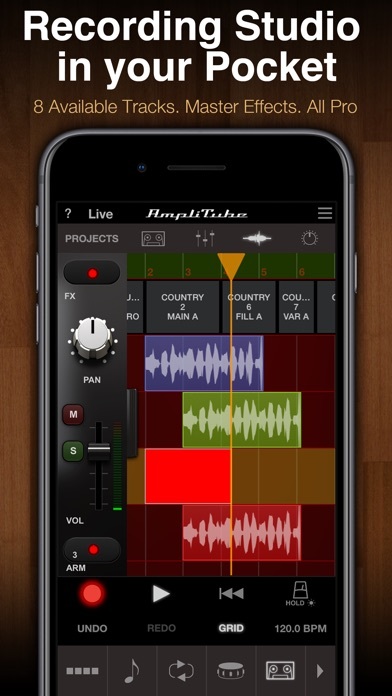 Although the DAW looks identical to the paid version on AmpliTube, for some stupid and undefined reason, AmpliTube Acoustic does not support simultaneous multi track recording us iRig Pro duo. 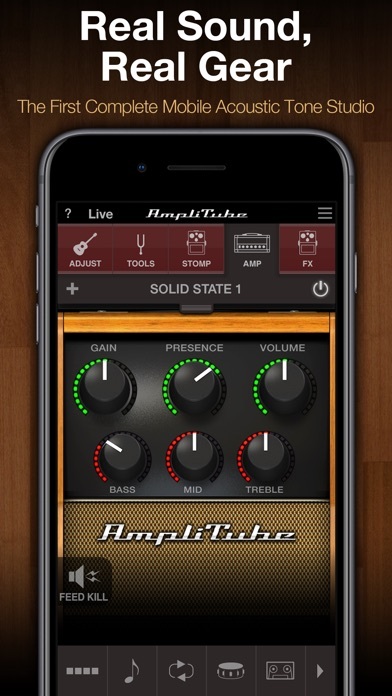 AmpliTube Acoustic only supports single track recording, very inexcusable. On a separate issue, IK Multimedia is way behind the times on file management. With the recent release of ITunes 12.7, managing recorded music is now a huge problem. I could but do not use SoundCloud as it does not suit me. I could email myself but this is a clumsy process. I have tried to get ITunes 12.6.3 working (not very well). The latest release of GarageBand supports the IOS 11 file management process and this seems reasonable. By the way, I am an acoustic guitar player and the amps and stomps etc is very impressive, my acoustic recording of voice and guitar are all that I really need. I have never had any issues with any IK Multimedia products as they have always worked as advertised. Thank you. 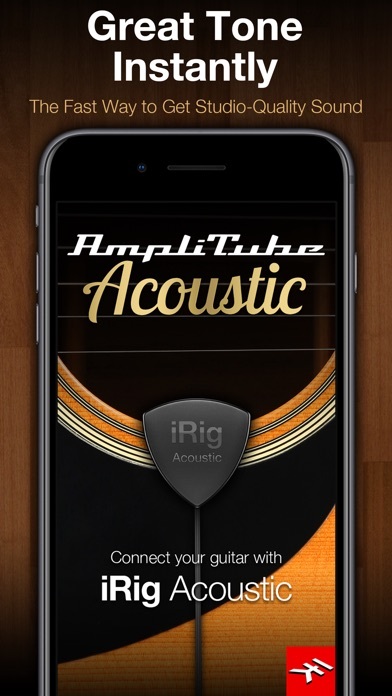 Concurrently I procured the paid version of iRig Amplitube Acoustic & JamUp Pro with Bias. I also examined each 8-track recorder. I had two iRig Acoustic pickups for my pupless axes (particularly world instruments), one for ios & one included in my Stage rig. For five months I ascertained through playing & recording which I preferred, them bought a second ios pickup. I contrived a simple converter cable to conform the headphone output to a guitar amp input (a major forum topic). In addition, I procured the iRig2 for pup-equipped instruments. My iRig priority is not set in stone, & I can easily meander through all systems to create my sick style of music. After months of fine tuning, I surmised that iRig ios is conducive to my current intentions, & bought the in-app 8-track recorder. I won't itemize the attributes which lead me to an iRig ios preference (sidetracking Stage), & shall spare details about the iRig multitrack recorder ($4x more than JamUp's). Nevertheless, the app's acoustic emphasis, presets, & functionality of the recorder (eg timeline & wav files), at the moment seem to put me in a creative Aura anywhere, anytime, & can tweak the tunes in Reason when I return to Earth. I purchased the DAW to do some multi track recordings, however as soon as I arm a second track for recording the app crashes. This happens every single time, and makes it useless for my purposes. I contacted IK Multimedia support. Let's see what they say. Will update my review if the problem is solved. The app is great and the effects are exactly what I've been looking for. However I purchased the recording workstation add on and 1 track works great. It crashes every time I try to add an additional track. I have high hopes this is fixed soon. I give 4 stars because i can't use my previous purchases in the new version but i think that all this new stuff is calibrated for acoustics so it have to be differents algorithms..For $9.99 you got all stompboxes and amps so it's no that bad!! Amps sound great. 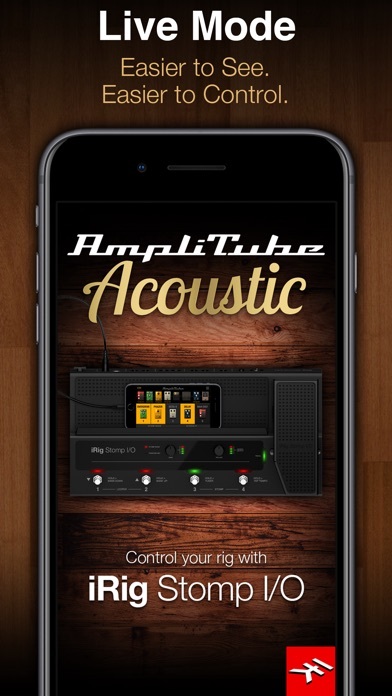 Definitely improves the sound of my acoustic guitar better than the regular Amplitube version. Downloaded lots of electric guitar tone apps for my acoustic guitar. Never was what I wanted. Amplitude acoustic is fantastic. Tones are great for any acoustic guitar. Definitely worth 10 bucks. 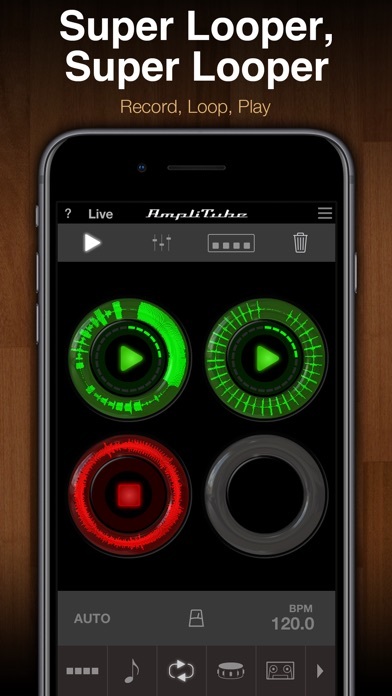 Once again IK Multimedia puts out a great app. They are innovative in their accessories and create to make recording and mixing simple. I use my acoustic with another pickup for now and iRig HD and it works well. There are some great sound capabilities. My only disappointment is that the app came out with some bugs. Every time I try to record another track it crashes. This happened with both the free and paid app and on both iPad and iPhone running the latest IOS 9.1. I am hopeful that soon there will be an update to fix this issue and give us the opportunity to record some good tracks. It will be an awesome app. For now I can only give it three stars. I tried to use this but it crashed so much trying to put a track together that I gave up and requested a refund.